Pick up by our English speaking tour guide from Beijing and drive to hotel. Free time for the rest of the day. If you want to sign up for Great Wall Marathon, please print the runners entry form, sign and photo it, send it to us as an attachement by email before March 21. Great Wall Marathon Inspection Day for runners and spectators on May 19. Pikup from Beijing International Hotel at 05h30, drive 2.5 hours to Huangyaguan Great Wall. Race-entry-meeting from 08h15 to 08h45. Course inspection from 09h00 to 10h30: All runners must walk the 3.5km of the wall that is part of the Great Wall Marathon course to familiarize themselves with the route. After the inspection, 1 hour Lunch break(sandwiches, fruit and one drink). At 14h00, be transferred back to Beijing by coach. Leisure on your own at the rest of the day. ChampionChip The Great Wall Marathon is timed by ChampionChip Timing system. If you do not have a ChampionChip, you need to buy it at USD 35. Huangyaguan Great Wall Huangyaguan section of Great Wall dips into the strategic Huangyaguan Pass, a large fortified garrison from the Ming dynasty has been somewhat modernized into visitor accommodation with the best view in town. 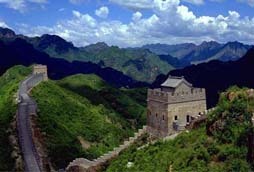 Beijing city tour at leisure on May 20. Please remember do not walk too much today. [ Optional ] Hutong Tour by Rickshaw: Hutongs are small alleyways where people live together in communities of homes packed into a small area，just like a museum of Beijing's folk customs. Exploring Hutongs by rickshaw can find the residents playing Chinese chess, Mahjong,etc. Great Wall Marathon Day for runners and spectators on May 21. Pikup from Beijing International Hotel at 03h30, drive 2.5 hours to Huangyaguan Great Wall. Opening of the marathon (warm up, a short speech) from 06h15 to 07h30. All participants MUST BE ON SITE at 6h30. 5k starts at 07h15, Group 1 of Marathon and Half Marathon starts at 07h30, Group 2 of Marathon and Half Marathon starts at 07h40, 10k starts at 09h30. Lunch break(sandwiches, fruit and one drink) from 10h30 to 15h00. Busses start leaving for Beijing at 12:00 hrs, last bus leaves at 16:30 hrs. Leisure on your own at the rest of the day. At night, you might join in the Marathon Party of Gala dinner on your own expense. Huangyaguan Great Wall Marathon The Huangyaguan Great Wall Marathon, Half Marathon, and 10K will be held in Jixian town, Tianjin City, China in May every year. The first course is awesome with 8K on the Great Wall with the 1800 steps; the second is 10K routes, travel through the farmland and villages and cover the 1800 steps. Olympic memory tour. Later today you will be transferred to airport for sweet home.